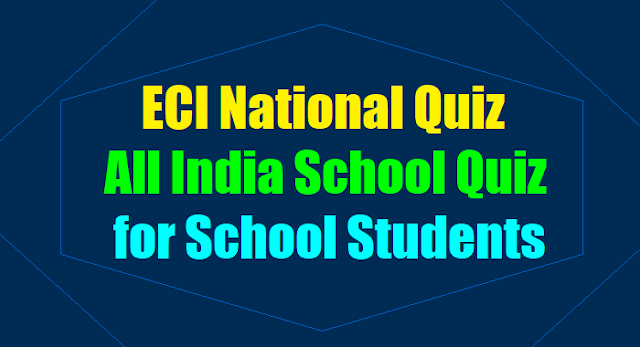 All India School Quiz for Class 9-12th students - ECI National Quiz 2017, CEO AP Telangana All India School Quiz for School Students, ECI India National Quiz for School Students, State level, Zonal level, District level All India School Quiz for Class 9-12th students: O/o CEO AP and Telangana - Memo.No.3981, dt:08.11.2017 - Sub: ELECTIONS- All India School Quiz for students in Class 9-12th - Conduct of National Quiz 2017 at District Level - Further instructions Issued. Copies of the references 1st, 2nd & 3rd cited are communicated to the Commissioner and Director of School Education, AP & TS. They are requested to issue necessary instructions to the District Educational Officers for extending full cooperation to the District Election Officers in conducting the National Quiz 2017-18. ECI File No.491 - ECI NationalQuiz 2017-18: This is in continuation of this office letter of even number dated 14th July on the aforesaid subject. As mentioned in the letter, the Commission has directed for a National Quiz to engage the young students in age group 14-17 years - the future voters. The Quiz shall entail 5 rounds. The Intra School Round within the School shall select the Team (optional - alternatively School may nominate the Team); the District Round at the District HQs shall be conducted by DEO's office for selecting the School Team representing the District at the State level; the State Round at the state HQs shall be conducted by CEO's office for selecting the School Team representing the State at the Zonal level; the Semi Finals and Final shall be conducted at New Delhi under the supervision of ECI. Some States/UTs shall be clubbed together for the State round, the same shall be informed in subsequent circular. The detailed structure of the Quiz is given in the Annexure. The Agency shall be in place by the end of this month and the Model Question paper for the Intra-School Round and Questionnaires for the District shall be shared by ECI by 15th October. The Agency shall also design the logo for the National Quiz and the same shall be shared with the CEO subsequently. Meanwhile, CEOs and DEOs may immediately set up Committees to steer the entire exercise of conduct of Quiz. The task of inviting Schools and setting up of Test Evaluating Teams may also be initiated by the QEOs. The CEO and DEO and the tentative timelines are given in the Annexure. It may be noted that the District Round and the State Round shall be an outreach event as well and accordingly these may be well publicized. Necessary directions may be given to the DEOs on these lines. Aim: Engage the young students in the age-group of 14-17 years - the future voters, in a self-learning exercise about the electoral process so as to build an aware and informed electorate in near future. Background: The theme for NVD 2017 was 'empowering young and future voters' and the year focussed upon future voters in the age-group of 14-17 years - the future voters. Interactive School Engagement was launched in two phases in January /July to promote electoral literacy among the students. The National Quiz for Schools is a part of the same outreach targeting school students in class IX-XII. Televising the Quiz in an interactive and interesting manner, aims at reaching out to young people falling outside schools /formal educational system. Structure of the Quiz: DEOs shall invite Schools. to· participate in the Quiz and send their team comprising two students (not necessarily from the same class). Students of Class IX-XII shall be eligible. i) To be conducted within the ambit of and by the schools. ii) Model content (including questions/answers set) would be shared by ECI through the DEO. iii) School Winners (team of 2 participants) qualify for the District Round and represent the School. Please Note: DEOs to encourage participation of girls schools and also representation of girls from co-educational schools. i) The District Election Officer (DEO) is in-charge of and would preside over this Round. ii) Content (questions /answers set) would shared by ECI through the CEO. The questionnaires furnished would have in-built provision for tie-breakers. iii) District Winners (School team) qualify for the State Round. I. Based on the number of Schools confirming their participation, DEO shall constitute an evaluating team comprising sufficient memhers(prefernbly from . cluc:Htion department] so that the evaluation is done on the same day. The District results should be announced on the same day as the written test. II. DEO's office shall identify the venue/s for the Round in advance and inform the participating Schools. III. The Test Day would also be a day for engagement and outreach to the target audience i.e. the participating students. Accordingly officials may interact with the participants, distribute merchandise and engage with them. The event may be duly publicized and documented. IV. The logistics(travel and accommodation) for the Winning Team representing the District in the State Round shall be borne by the concerned DEO. I. The Chief Electoral Officer (CEO) is in-charge of and would preside over this Round. The CEO would be supported by an Agency representative during the conduct of the Quiz. II. Content (including promotion and questions set in OMRformat) would be rendered by the Agency. The questionnaires would have in-built provision for tie-breakers. III. State Winners (School Team) qualify for the National Semi-Finals. II. The Test Day would also be a day for engagement and outreach to the target audience i.e. the participating students. Accordingly officials may interact with the participants, distribute merchandise and engage with t~em. The event may be duly publicized and documented. III. One representative from the Agency shall assist the CEO's team during the conduct of the State Round. The local transportation and accommodation facility for the Agency representative for upto 2N/3D shall be extended by the office of the CEO. This however shall not mean re-imbursement of any expense incurred by the agency representative. IV. The logistics (travel and accommodation) for the Winning Team representing the State in the Semi Finals/Final shall be borne by the concerned CEO. Semi Finals and Final would be on-stage round that would be shot in a Studio at New Delhi and produced for national telecast. This shall be conducted under the overall supervision of ECJ. 1. Set up a State level Committee to steer the entire exercise of conduct of Quiz in the state. 2. Coordinate and overall supervise the District Rounds of the Quiz. 3. Reserve centres/venues for the State Round in the capital and arrange related logistics. 4. Organize and preside over the State Round. 5. Coordinate with the Agency representative for the State Round Quiz evaluation. 7. Produce and provide T-shirts/merchandise to the participating students. 8. Felicitate the State winning team suitably at State level or during NVD function at State HQ. 9. Arrange A/V shoot of the State Round and get the raw footage from District Rounds and furnish to the Agency. 10. Promote and publicize the State Round in specific and the National Quiz in general on official social media handles (as per ECI specifications). Note: One Agencv Representative will be associated with the Chief Electoral Officer's team during the conduct of the State Round of the Quiz. The Agency along with the ECI, District Election Officers and Chief Electoral Officers would have shared responsibility as far as responding to instances of crises is concerned. 1. Shall set up a committee to steer the District Quiz. 6. Organize, preside and evaluate the District Round and declare the winners on the same day as the Quiz. 9. Arrange Travel and accommodation for the participants from the concerned district to the city selected for the State Round. 10. Produce and provide T-shirts/merchandise to the participating students. District HQ. More prizes may be given to encourage participation. 12. Promote and publicize the District Round in specific and the National Quiz in general on official social media handles (as per ECJ specifications). 13. Promote and publicize the District Round in specific and National Quiz in general within the am bit of the concerned district. Round, District Rounds, State Rounds, Semi-Finals and the National Final. 2. Create OMR code answer sheet, evaluation sheet, software etc for evaluating the written test of the State round. Assist the State in evaluating the test papers in State Round and selecting the winning team for the Semi-finals. 3. Develop digital tool/format/animation etc for the Studio Round of the Quiz. The Quiz should be attractive, interactive, interesting and diverse in format and content to engage the TV audience. 4. Host and Present the on-stage/Studio rounds of the National Quiz. 5. Generate creative content to be used for cross-media promotion and publicity (Television, Radio, OOH, Online and Social Media especially Facebook and Youtube besides hoarding, banner, pamphlets, merchandise designs). 6. Use the raw footages provided by Districts and States as a pre-cursor to the Semi-finals and Final episodes, or as part of these episodes besides as snippets for social media promotion of the Quiz. 7. Generate creative content for the branding of the National Quiz. 8. Design and develop an effective media plan for the National Quiz. Memo.No. 3981, dt: 25.09.2017: Sub: ELECTIONS- All India School Quiz for students in Class 9-12th - Conduct of National Quiz 2017 at District Level- Further instructions Issued. Ref: 1. From ECI, New Delhi No.491/SVEEP• II/EL/National Quiz/2017, Dt: 14.07.2017. 2. This Office Memo.No.2757/Elecs.E/A2/2017-29, dt: 18.07 .2017. 3. From the ECI, letter dated:20.09.2017. In continuation of the memo 2nd cited, a copy of the ECI letter 3rd cited is communicated to all the DEOs & Collectors in AP and TS and the Commissioner GHMC and DEO Hyderabad. They are informed that the Commission has directed for conduct of a National Quiz to engage the young voters in age group 14-17 years - the future voters. The details about conducting the National Quiz are available in the Commission's letter. 2. The responsibilities of the DEOs for conducting the National Quiz 2017 are as follows. 2. Invite schools for participating in the Quiz. 3. Share questionnaire/key to schools for the Intra - School Round. 4. Accept list of teams from each school within the district. 7. A/V shoot of the District Round and supplying raw footage to the Agency. 8. Forward name of members of District School Winning Team to the CEO for the state Round. 11. Felicitate the District winning team suitably at District Level or during NVD function at District HQ. More prizes may be given to encourage participation. 12. Promote and publicize the District Round in specific and the National Quiz in general on official social media handles (as per ECI specifications). 13. Promote and publicize the District Round in specific and National Quiz in general within the ambit of the concerned district. Memo. No.3981, dt:03-11-2017: Sub:- SVEEP- Intro- School Round of ECI National Quiz 2017-18- Sharing of questions for the round - reg. 2. This Office Memo.No.2757/Elecs.E/A2/2017-1, dt:lB.07.2017. 4. This Office Memo.No.2757/Elecs.E/A2/2017-2, dt: 25.09.2017. 5. From the ECI, mail., dated: 20.09.2017.